“The 2011 winners represent an exceptional combination of ingenuity and technical advances,” said Mary Beth Aberlin, Editor-in-Chief. The Scientist magazine announced today the winners of the “Top 10 Innovations of 2011.” For the fourth consecutive year, The Scientist invited members of the life science community to submit descriptions of exciting tools that made an impact in research this year and asked a panel of expert judges to evaluate the technologies. Neurobiologist Björn Brembs of the Freie Universität in Berlin, neuronal cell biologist Michael Kiebler of Medical University of Vienna’s Center for Brain Research, Biovista president and cofounder Aris Persidis, and Pacific Northwest National Laboratory biologist H. Steven Wiley reviewed more than 65 entries in the fourth annual Top 10 Innovations competition to whittle down the products to the 10 best. This year's winners include a suite of exciting advances in microscopy—such as two products that break through the boundaries of conventional resolution and a pocket scope that costs less than $10 and can be affixed to cell phones—a gadget that captures light exposure and activity to generate data on circadian rhythms, a 360-degree imager that can detect biomolecules in live animals, and a mini MRI machine that negates the need for lead-lined rooms and expert technicians. Claiming the top spot in the competition is University of California, Los Angeles, electrical engineer Aydogan Ozcan for his Lensless, Ultra-wide-field Cell monitoring Array platform based on Shadow imaging (LUCAS), a microscope that can hook onto a cell phone, costs less than $10, and could become a boon to research efforts in the developing world. Second prize goes to BioFLECT, a 360-degree optical imager made by Bioscan that uses a rotating ring of 48 detectors to generate 3-D images of fluorescent markers in live animals. In third place is Idaho Technology Inc.'s FilmArray system, which simplifies sample prep to the point that a 9-year-old can perform PCR reactions. 3) FilmArray system; Idaho Technology Inc.
Read the complete feature in The Scientist's January 2012 issue. 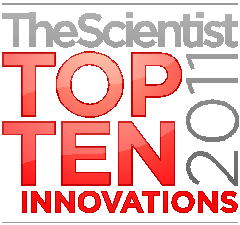 The article is also available online at http://the-scientist.com/2012/01/01/top-ten-innovations-2011/. THE SCIENTIST is a print and digital publication that covers a wide range of topics central to the study of cell and molecular biology, genetics, and other life-science fields. Through innovative print articles, online stories, and multimedia features, the magazine explores the latest scientific discoveries, trends in research, innovative techniques, new technology, business, and careers. It reaches leading researchers in industry and academia who value penetrating analyses and broad perspectives on life science topics, both within and beyond their areas of expertise. Written by prominent scientists and professional journalists, articles in The Scientist are concise, accurate, accessible, and entertaining.